I was doing some work on my computer with a friend sitting next to me, and her jaw dropped when she saw me navigating through the file open dialog with just the keyboard… so I decided to write up a number of other keyboard methods as well. Note: Expert geeks are excused from today’s lesson, but there’s extra credit for mentioning any methods that I forgot to include. I’m sure you are less amazed than my friend was. You can type ..\ to get to the directory above the current one, and then start typing the name of a folder or filename. You could even use ..\..\ or any number of levels to continue to traverse up the directory tree. Included in Windows Vista (or XP) are a list of shell folder shortcut names that will let you type something as simple as shell:desktop to go to the desktop folder. We’ve even got the full list of shell shortcuts for you. A better example would be %appdata%, which takes you to the C:\Users\\AppData\Roaming folder. To see a full list of these variables, open a command prompt and type set. Just remember to surround the variable name with percent signs as shown in the example. After you hit the Enter key, you’ll be prompted for your FTP password, and then you can browse the FTP site like a local folder. Note that this method will possibly be slow. You can just start typing the full path to a file if you’d like. It might take longer than some of the other options, but at least you’ve got full control. 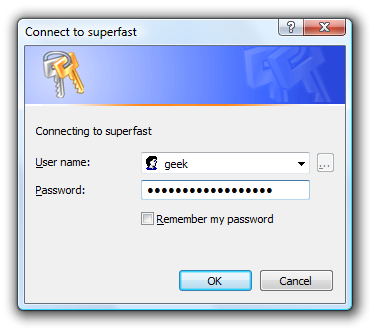 In Windows Vista, if you hold down the shift key while right-clicking on a file or folder, there will be a new option called Copy as Path, which will copy the full path of that file or folder to the clipboard. 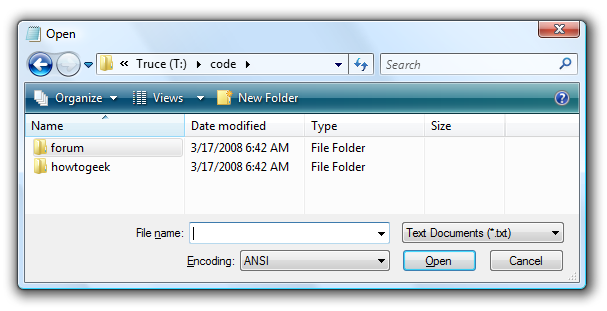 You can then paste that path into the File name box and hit the Enter key to open it. Note that you could use the keyboard to paste the path in, but I couldn’t really take a screenshot of that. Many of these methods work in other operating systems as well… for instance, you can use the ../../ method on Linux.